This month’s topic for our Vibrant Newsletter was Back-to-School, and as I started researching for my article I found tons of valuable information that just wouldn’t fit into a 200 word article. Over the year’s I’ve noticed going back to school seems to be a really big stressful deal for many families. In fact, at some churches I’ve worked at, it seems to be such a monumental deal that it even affects church attendance for weeks! Whoa! Can you say modeling wrong priorities? If getting your kids ready for the school year is stressing you out, stop, do not pass go, and do not collect $200. Take a deep breath and remind yourself that this is not a big deal, you just need a bird’s eye overview and a simple plan. Remember, you can do all things through Christ! Start with taking some time a write down every detail of what needs to be accomplished before school starts. Then prioritize it, for example, if your child needs a physical, this will take more time than running to Walmart to pick up some school supplies. You need to make an appointment most of the time, so on your timeline, items like this come first. Then do you need to register or sign up for activities like sports? Of course, you’ll have some shopping for clothes and supplies. To help my budget, I used to pick up one or two items my kids needed each time I shopped for groceries. This really took the sting out of the wallet because it spread the expense out in small bite sized chunks. Plus, I hate shopping, so it eliminated that marathon feel from the whole experience. Appointment for Bobbie’s physical – Dr Jones – August 2nd @ 2 p.m. If your child suffers from anxiety about going to school there are some great resources on the internet that will give you some great ideas. Here are some I found. In your conversations, always speak positively about the upcoming school experience. Don’t fall into the trap of letting your child’s anxiety manipulate you. For example, if they cry about getting on the bus, don’t give in, make them get on the bus with reassuring words like, “ You are going to have a great time. I believe in you, you can do this. I’ll see you before you know it and you can tell me all about the exciting things you did and learned.” This is a good opportunity to bring some spiritual application into the experience. Have your child learn some “anti-fear” Scriptures so they have them in the arsenal when fear tries to attack them. “Fear not for I am with you.” Isaiah 41:10, and “God has not given us the spirit of fear, but of power and of love, and of a sound mind.” 2 Timothy 1:7 are just a couple. Also driving them to the school in advance and maybe playing on the playground, or looking in the classrooms may help relieve some of their tension. Even if your child is not experiencing apprehension, it’s a great opportunity to discuss the spiritual challenges they may face in the school setting and to coach them, not nag, on making Godly choices and being an example. If you’ve never taught your kids about standing alone, this would be a great time to do it. It’s our job as parents to set our kids up for success by teaching them the “whys” and “hows” of making Godly decisions. Another great idea is to begin to slowly adjust bedtime back from summer mode to school mode, so that by the time school starts the kids are already back in their routine. Over the summer vacation, your kid’s brains can turn to mush. They are most likely out of the classroom discipline mode of daily studies and like any muscle, your mind needs consistent exercise to stay strong. If your kids begin reading everyday and then either discussing or writing about what they read, they can start the year off ahead of the game. You may want them to also start doing a few math problems as well as any other subjects that your child might struggle with. Even if they excel, they can still get rusty. So getting ready for Back-To School is really no big thing if you do just a minimal amount of planning and organization. You will set up a win for both you and your child! • figurative an action or event marking a significant change or stage in development : the speech is being hailed as a milestone in race relations. I just finished a project that I have been working on for over 40 years. It cost me many sleepless nights and countless sacrifices but it was worth every moment. 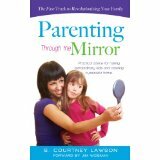 I just finished my first book on parenting, Parenting Through the Mirror. It was birthed in the school of hard knocks and it is my sincere desire that God will use it to help many parents find their way through the mind field of life. By the grace of God I stand safely on the other side with my husband of 43 years, 3 wonderful kids who serve God along with their spouses, and 7 beautiful grandchildren with one on the way. I am a blessed woman!